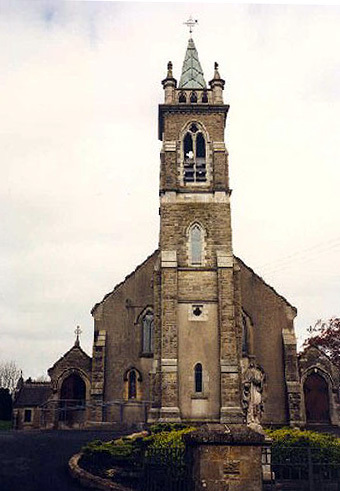 The Tinnenys of Goladuff were in the Catholic Parish of Galloon, which is served by the present day Saint Mary's Church, in the town of Newtownbutler. In 1996 the only Tinneny who was a member of Saint Mary's was Peggy Tinneny McKenna. Peggy's father Thomas Tinneny was born and raised on Goladuff. At the time Peggy lived in Cullion, Newtownbutler, which was within the parish boundaries. The Tinnenys on Goladuff would frequently go to Mass and other functions at Saint Mary's by cot (boat). This was the typical mode of transportation to church, especially in the winter when Goladuff was cut off from land by flooding and at other times of the year when the ground was soggy. Photo: Saint Mary's Catholic Church, Newtownbutler. Francis Fitzpatrick of Derrydoon, provided a good deal of history about the parish to John Joe McCusker for use in his book Memories of Newtownbutler and Cannon Tom Maguire which was published by McBrien Printing. Mr. McCusker gave permission for me to quote and to paraphrase the portions of his book contained in this chapter during a conversation with him in September 1994. Mr. McCusker recounted that, the origin of Saint Mary's Parish goes back to the founding of the Galloon Monastery by Saint Tiernach around 500 A.D. Galloon remained a monastery for about 700 years. About 1200 A.D. it became a parish served by a church and a parish priest. When the Holy See in Rome assumed responsibility for the appointment of parish priests, around 1300 A.D., the medieval documents referred to "the parish Gallon, alias Dartray - Connins' or Connons'. The last Parish Priest of the old medieval parish of Galloon was Father Bernard Casey who died in 1779. Under new arrangements made about 1800, after the death of Father Casey, Father Francis Goodwin took up residence in Newtownbutler and the parish became known as Drumully. By this time we know for sure that the Tinneny's were part of the parish as evidenced by the grave marker of Thomas Tinneny of Goladuff in Drummully Cemetery which is dated 1807. In 1955, Bishop O'Callahan decided to revert to the older form of parish names thus the parish name reverted back to Galloon. Father Francis Goodwin built the present church in 1819. Originally the roof of the church was thatched with straw and there was no bell or bell-tower. Since it had no bell-tower, some of the local residents described it as looking like a barn. Father Clark, who succeeded Fr. Goodwin in 1837, was forced to flee from the parish in 1854 for officiating at the marriage of a Protestant girl, Ann Jones and a Catholic man named Patrick Teague. For a priest to perform such an act in those days was criminal in the eyes of the civil administrators and a warrant was immediately issued for his arrest. A friendly policeman from Lisnaskea came to Newtownbutler disguised as a tramp and warned Father Clark of his impending capture and possible imprisonment. This enabled the priest to make a safe escape. I hope you pay attention since on you I do call. For a Newtownbutler clergyman is always just and true. and leave his flock and parish and cross the raging sea. Through rolling seas and boundless waves where stormy winds do blow. Who for every cause of Prudence, right firmly did stand. May he arise on the last day some happy visions see. With Father Clarke by his right-hand his advocate to be. When they learned the sudden exit of one of them so dear. Where the Albert Steamboat there did wait to take him far away. With Father Clarke on board of her she split the angry spray. From the clergy and the laity as you can plainly see. For they knew he was a pillar in the Holy Church of Rome. To see him dressed in Christ's blessed robes all in his seamless gown. And that spotless Host he left again once more before their eyes. To the Reverend Mr. Thornhill for what he helped to do. Who bravely fight to make our land a nation once again. Three cheers for valiant Goodwin, is worthy of applause. For his Religious Pastor he exercised his skill. And brought him back unto his flock from far beyond the hills. Photo courtesy of Peggy Tinneny McKenna. After the departure of Fr. Clarke, the Bishop of Clogher, the Most Reverend Doctor Charles McAnally, appointed Father Patrick Trainer as administrator of the parish. Father Traynor started renovations on the church in 1858. As part of the project, John Donegan, a Dublin jeweler and native of the parish, donated a bell which bears his name. The expensive bell was brought from Dublin by horse and dray via the main road that runs through Counties Meath and Cavan. They continued into County Fermanagh, across the Finn River at Wattlebridge and finally arrived at Newtownbutler. There were no British checkpoints in those days between County Fermanagh and County Cavan as there were when I visited in 1991 and 1994. Father Traynor built a tower to house the bell and when it first rang a large group of Orangeman (Protestants) came into the village. They started a row and threatened to pull the bell down. In response to a call from the local Royal Irish Constabulary, a detachment of British Lancers, who were billeted in the garrison in Belturbet, were dispatched to Newtownbutler where they engaged the Orangemen. In the ensuing fracas the Orangemen were forced to retreat leaving two of their number dead by the roadside. In an effort to defuse this dangerous situation, an agreement was reached between Bishop McNally and the Royal Irish Constabulary Sergeant in Newtownbutler. The agreement was that the bell would only be rang prior to the celebration of Mass. As a result of this compromise made in 1858, the traditional Angelus bell was not rung in the Catholic Church in Newtownbutler for the next seventy-eight years. Shortly after his appointment as parish priest in 1936, Father Tom Maguire decreed that henceforth the Angelus bell would be rang at 7:30 a.m., 12:00 noon, and at 6:00 p.m. each day. In 1858, when the church was reopened following renovations, it was dedicated to Our Lady of the Immaculate Conception. It was in that year Our Lady appeared many times to a young French peasant girl, Bernadette Soubirous, at Lourdes, France. During one of these apparitions Bernadette was heard to quote Our Lady as saying "I am the Immaculate Conception." This is how Saint Mary's Church, the church of our Tinneny ancestors, on Drumquilla Hill, Newtownbutler, near the shores of Lough Erne, was among the first in the world to be dedicated to Our lady of the Immaculate Conception. John Donegan also donated two silver chalices to Saint Mary's. The chalices were engraved with the following: "Presented to the parish of Drumully by John Donegan, 20th December 1848 Rev. J. Clarke P.P." These chalices were used in Masses attended by many of our ancestors, including Big John and his son Yankee Pat. The chalices were still at Saint Mary's in 1997. There is another even closer connection of John Donegan, the benefactor of St. Mary's, with several of the desendents of Mary Tinneny of Goladuff in that he was related to Lucy Murray Sherwood, her mother and siblings.